Last year’s RallyX Nordic runner-up Oliver Solberg is aiming to go one better in 2018, as he returns to the burgeoning series with his sights firmly set on clinching the headlining Supercar class crown. 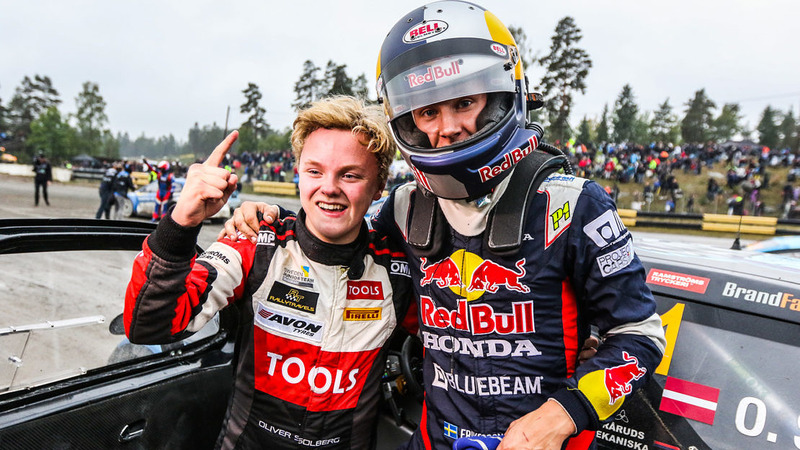 The rising Norwegian star – son of two-time FIA World Rallycross Champion and 2003 FIA World Rally Champion Petter Solberg – impressed over the course of his rookie campaign in RallyX Nordic, duelling it out with countryman Thomas Bryntesson for the Supercar title and winning two of the six rounds en route to the runner-up laurels. He similarly turned heads in RallyX on Ice earlier this year, setting the pace throughout the qualifying stages in the RX Academy at Östersund. Having become the latest high-profile name to commit to RallyX Nordic for 2018 – behind the wheel of a Citroën DS3 Supercar fielded by the family-run PSRX outfit – Solberg is bidding to build upon his experience while resolutely targeting the top step of the podium. “I’m really happy to be back in RallyX Nordic,” enthused the 16-year-old, who is currently studying at Le Mans in France. “Driving these Supercars is so much fun! The championship is looking good again this year, with rounds in Sweden, Norway, Denmark and Finland and the competition will be very close. “I’m really fortunate to have my parents’ support. Both of them understand this sport – it runs in the blood in the Solberg family, right from my grandparents. That said, my dad and I hate to lose, so it’s fantastic when we both have a good weekend but it can be pretty tough for mum if we’ve both had a difficult one! The full 2018 RallyX Nordic entry list will be released at 14h00 CET today (23 April).